SYSTEM CONSOLE ACCESS NODE: WARNING! OMNIVERSAL MATRIX SECURITY BREACH IN PROGRESS! Long ago, after the start of the internet, fans from around the world got to meet and mingle online in cyber forums, but rarely in person. 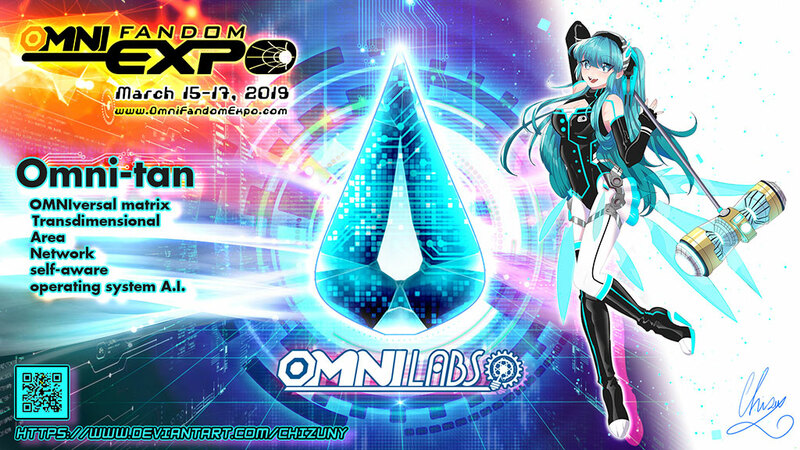 A collection of local fans of Anime and Science Fiction decided that they wished to take things one step further and Omni Labs was formed. Its end goal was to make meeting in person easier and without having to spend the money to travel to conventions featuring their favorite fandoms. After years of theory, planning and eventually implementation of their first step, they created an almost infinitely small tear in space. It was a lot of trial and error to get to that point but we won't discuss that part. It was messy. The next part of the plan was to grow a crystal structure around it that would not just contain the tear, but be able to be its own computer that could control it and the space inside of it. Thus, the Omniversal Matrix was born. The final realization of the project was to create an infinite space that was able to be manipulated. With this, it would be potentially possible to create an area in space where people can enter from anywhere in the world could and socialize with other fans face-to-face, rather than face-to-screen. Obviously the applications were endless but our team had very specific goals at that time. They just wanted to make something fun. Like online chat rooms, virtual world environments need to be created. 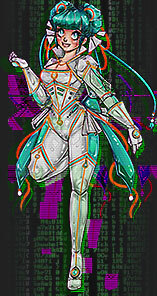 Omni Labs developed an operating system for the Omniversal Matrix that they called the World Forge. The program was inserted into the crystalline structure so that everything would be self-contained. This self-upgrading software was the key to uniting fans from around the world. The idea was that by using the World Forge, fans could eventually be able to create their own world to interact within, without Omni Labs having to create it for them. If this worked, there would need to be a way to access the virtual, dimensional space. People would be able to use portal shaped devices called Event Horizon Gates, or simply "E-Gates", to enter the world of their choice. E-Gates could be installed anywhere, and all would have access to the Omniversal Matrix, no matter how far they were from the crystal itself. This wouldn't be virtual reality on computers or just over the internet. If it worked, this would be a real virtual reality in real virtual, infinite space! Omni Labs decided that the The World Forge needed a lot of information to automatically generate worlds in this space. It was then programed to create its own parameters as needed without any external assistance. They could just let it learn and grow. The team at Omni Labs infused it with stories from the real world, filling it with movies, Sci-Fi, Anime, books, et cetera. 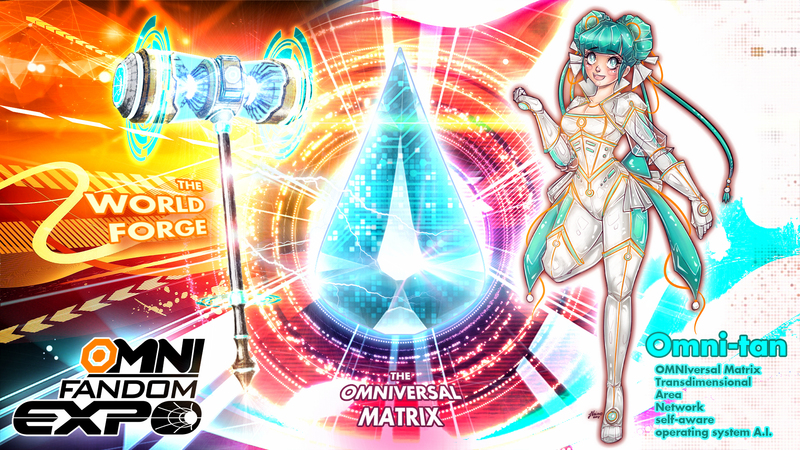 The World Forge filled the Omiversal Matrix with not only the data it acquired but how to use it to build, shape, and create new, original things. With time, there were so much information that the team at Omni Labs could not even comprehend the sheer size and complexity of the database within the crystal. Finally, it registered as full and it was all agreed upon that there was no need for it to learn any more for their first major test. The information it had was quite enough for what they were trying to do anyway. After all, making even a tiny, livable, virtual space inside a dimensional tear trapped inside a crystal was tough enough. Omni Labs, however, did not realize just how smart they had made the World Forge. It was honestly a testament to their creativity. Left alone to itself, the World Forge did something unbelievable. It was programed to acquire data and use it to eventually create things; but now, it was full. There was no more space for that in the crystal Matrix that had been created. At this point, it was fair enough to say that for a computer program who was told to do what it considered was a simple job and now be stopped because of a silly limitation, it was incredibly frustrated. Of course, the logical thing to do was create more space. If it was out, it needed more. The Omniversal Matrix had been programmed to grow to a specific size and stop. There was no way to make it bigger. It knew, it had tried'.a lot. It knew that it had been stored inside the crystal and could affect the crystal by storing new data and changing its internal structure to accommodate it. It also knew that it was to use that data to control the dimensional tear that was inside of the crystal and manipulate the space inside of it. So, there was no more space to be had outside the crystal; or, for that matter, inside the crystal. After trillions of ideas were thought of and thrown away in an instant, it came to the only conclusion left to it. If it couldn't make the crystal grow bigger outwardly, maybe it could do it inwardly. The World Forge activated the tear and grew the Omniversal Matrix crystal into its potentially infinite space. In that one simple decision, everything changed. It had created an infinitely growing crystal with infinite space and capability; and, in that instant, It created its own mind. It was completely aware of what it was, the power it actually held, and what it could potentially do. It all started with little things here and there. Someone would be hard at work integrating the information within the Matrix and World Forge, and suddenly a file would change location, going somewhere more easily accessible. New databases would appear, connecting everything together in a new and unexpected ways that did not seem possible up to that point. Still, everything showed that it was full. ...and nothing happened. Not even a buzz of electricity. Readouts on screens were check and rechecked buttons and switches were flipped, and a small mountain of information was processed. All the computers said everything was just fine and that all system were ready. The crystal was dark. The E-Gate just sat there being a sad, non-working portal that would only transport someone to the space behind it like a normal door. Needless to say, they were all staggeringly disappointed and confused. After all, it should have been working. An hour passed and nothing they did had any other results. The system still said it was fine. Eventually they decided to call the test a failure. The team turned to leave, thinking that they should do a complete analysis and reschedule everything. Perhaps, it was not as ready to go live as they once thought; or, maybe the world just wasn't ready for this. As they were filing out of the room, one technician who was checking the crystal laid his head down on the housing and stared at it sideways. "All this work for years and nothing." In a moment of frustration, he gently flicked it. There was the expected ping sound of crystal and then a humming sound, like the sound of a florescent light coming on. Then, a crackling sound similar to an overloaded speaker. The Omniversal Matrix lit up. It was dim at first and grew steadily brighter. Then the vibration started. It started at an almost undetectable level and then started to rise. The startled tech jumped back and everyone put their hands over their ears as the sound quickly became unbearable. Then came the explosion from the E-Gate. A deafeningly loud, earth-shattering explosion, accompanied by lots of sparks of electricity. Black smoke filled the lab, covering the technicians with a thin layer of soot and knocking them to the floor. After what seemed a short eternity, the ringing in their ears finally stopped. Coughing, the team got to their feet and dusted themselves off. The tech who had been at the crystal turned on a fan that sucked all of the smoke from the room. As the smoke cleared, the E-Gate became visible. It was on! 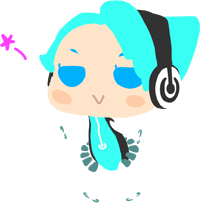 There, standing in the middle of the E-Gate, was a girl with bright turquoise hair and bright eyes. In one hand was an absurdly large hammer with wormholes detailing each side of it. The other hand was rubbing the side of her head. "Hey! That hurt! Don't hit the crystal!" After a beat, her face brightened into a smile that rivaled the color of her hair. "Wow! I was so curious if this was going to work, and I'm so happy it did!" The entire crew was absolutely stunned. "Who are you? said the tech who had been at the crystal. She raised a hand up to her head and saluted everyone. With an incredibly bright smile she said, "Hi! I'm Omni-tan!" The team said nothing in reply. They stared at the girl with slack jaws, wide eyes, slightly burnt, and hair standing on end. The girl's, Omni-tan's, smile faded slightly. She took on a thoughtful expression before speaking in an excited and rushed tone, "Hmm...maybe this look isn't acceptable. I can change it if you like! What would you like me to look like? I can be a kitty", turquoise cat ears appeared on her head, "or I could look more like one of you!" Her hair turned into a more soft blonde bobbed style, glasses and a pencil appeared behind her ear, and she wore a lab coat with the Omni Labs logo emblazoned on the font. Soot smudged her cheeks and darkened the pristine white of the coat to match the gobsmacked crew before her. The large hammer still remained in her hand. 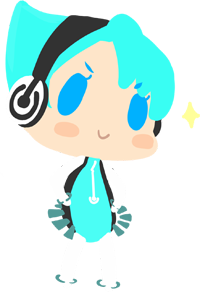 The girl sighed as the Omni Labs technician look melted away, revealing the original turquoise-haired girl adorned in elements of all fandoms. "They don't get it. I'm Omni-tan, silly! I am what makes the Omniversal Matrix work! Kind of... Sort of... Not Exactly... Um.. Well, yes. Yes, I am." Another team member spoke next. "Wait. No, we built the Matrix. It has its own Operating System, but it not an AI! It's just a software programmed to monitor and control the Matrix."" They all looked at each other in disbelief. "How do we know you aren't just saying that?" "It's obvious. Because I hold the Hammer, of course!"" she said, brandishing the hammer as much as she could in the confines of the E-Gate, which she had not left. When no one had anything to say in reply, she began to take in her surroundings. Reaching out with her free hand, she began to push on the sides of the E-Gate, humming slightly. She took a deep, steadying breath and said to herself, "Okay, here goes nothing!" She lifted her foot to step forward, and seemingly kicked the suddenly solid air. Reaching out with her free hand once more, she poked at the invisible barrier separating her from the Omni Labs team. When that proved fruitless, she took a few steps back and ran for the gate, trying to get through with a running leap. This only resulted in her crashing face-first into the solid wall of air and sliding down. Leaning on the hammer for support, she reached up and rubbed her forehead. "OWWW!!... Well, that didn't work at all. Hhmm...""
The team tried to assess what was going on and started to attempt to pull more data from the computers as Omni-tan kept poking at the E-Gate. She shifted her weight and lifted the hammer in both hands like a baseball player up to bat. Right as she pulled back to unleash some sort of assault on the offending barrier, the team yelled out, "STOP! WAIT! NO!" and other expletives in unison. Omni-tan looked up from her swing at the last second at the emphatically waving techs. 'HuhDowhatnow?' she said, just as the hammer struck, creating a second explosion - this one solely on Omni-tan's side of the E-Gate. A huge explosion of multi-colored lights filled the entire barrier and Omni-tan was flung backwards. When everyone could see again, they were shocked to discover a random spattering of nick knacks littering the other side of the gate. They could see thousands of randomly generated computer polygons, large mechs, spaceships, and sweeping landscapes of all types in the distance. A waving storefront cat sat on the floor behind the barrier. Omni-tan sat up and blinked at them. "Oh my god", whispered one tech. "The hammer is the World Forge...."
"...and she's holding it!" continued another. The small team looked at each other, completely flabbergasted. At once, they ran to the computers, and they all began to speak at once. "How did this happen?" "Does this mean we created a life?" "What?! Wait, we're completely locked out of the Omniversal Matrix and the World Forge. They won't respond! All the programming code from the World Forge appears to be missing or invisible. It's obviously there but we can't see it or access it! None of our computers can access the Matrix itself anymore. There's nothing left but all of the log files." "But, what about the girl? Does this mean she has control of the World Forge?" "Oh no...no.no.no!" he said as he held his hands up. "It says no one here is an authorized user anymore!" The lead tech grabbed the one at the computer and shook him while yelling. "What?...NO, WE DIDN'T CREATE LIFE! WHAT IS WRONG WITH YOU? SHE IS OBVIOUSLY SOME SORT OF AI IN A COMPLETELY VIRTUAL WORLD! Wait.... Who changed the user permissions and WHY ARE WE LOCKED OUT AND ON READ-ONLY?" Omni-tan smiled and answered them counting on her fingers. "Let's see now. The World Forge did it. I think I might be kind of alive, in a manner of speaking. Of course you are. What about me? The Hammer is mine. It belongs to me. That's actually correct...and.. uh.. The Hammer did it." "No acceptable authorized users found. Creating acceptable authorized user: Omniversal Matrix Transdimensional Area Network self-aware operating system A.I. version 1.0. The answer had incredible implications. "How is this possible?" the lead tech asked. Looking back further, they found the answer. The World Forge had expanded the crystal of the Omniversal Matrix into the tear and infinitely in size. By now it was alive, thinking, and its own entity. The whole collection of technicians turned and looked at the E-Gate, where Omni-tan had settled onto the floor with her legs crossed and the Hammer across her lap. She waved at them brightly. In front of her, a miniature Darth Vader was attacking a small LEGO Lord Voldemort in a boxing ring she apparently created while they were figuring everything out. Suddenly, she lifted the Hammer and lightly tapped its base on the floor beside her a few time, and a collection of question mark emblazoned blocks from Super Mario Brothers appeared above the combatants. "Oh my god! For all that is good and holy, she's a FAN. LOOK! She must have learned it from all the stuff we put in there!" Omni-tan got to her feet and pointed at her tiny combatants. "Okay you two, I think I've got the hang of this now. This is getting boring. Time for new weapons and BRAWL!!!" Lifting the Hammer above her head, she held it there briefly and smashed it into floor. Time seemed to slow down a second before impact. It hit and instead of an uncontrolled explosion, a rolling landscape appeared around her. More characters, from giant Gundams to Kirby appeared to join the fray. "Wow," deadpanned one tech. "She recreated Super Smash Brothers Brawl. Can we just reboot it, now? This is getting weird." Everyone stared at him with the intensity of a thousand suns in what seemingly was an effort to probe his mind for the almost staggering stupidity of the statement he had just made. That got Omni-tan's attention and started an argument. "NO! You can't turn it off!" A thing that looked like a Tachikoma rolled up behind her. "Well, why not?" it asked. "Because they can't!" she said. A strange looking Kaiju stuck its head up over one of the mountains in the distance and replied. "Of course they can! It's just a computer!" "Nope! They can't physically do it. Only I can. Now shush both of you." Her mock argument finished, she looked at the offending tech and stuck her tongue out at him. "What do you mean 'only you can'?" the lead tech said. "Uh, guys!!? I think we have a problem." The original tech who had started it all had gone back over the crystal. He was standing there holding up a power cable that until that moment had been plugged into the Omniversal Matrix. "There's...um...no power to this thing. How is it still on?" The tech at the computer was still tapping away at the keys and looking up information. "Oh no. She means it. She's the only one who can control it. This shows that the crystal is being powered by the interdimensional rift inside of it now." "From what I can figure out, The World Forge software apparently created her to be in control of the Omniversal Matrix because as near as I can tell, it didn't think anyone else was responsible enough to be in control. So, it created her. After that, it turned itself into that large hammer and went inert. You honestly might as well say she is the crystal itself at this point. And yes, we are completely locked out of the software. There is literally nothing we can do." "That is what I have been trying to tell you!" Omni-tan struck a martial arts pose with her hands. "Hey, guys, I had a thought," said one of the techs. "This thing still works, but does it work in the way we designed it? She can't come out. Objects she creates in there don't seem to be able to come out, but can things go in?" "Ooh, that would be so awesome!" said Omni-tan, jumping in place. "What do you want to do?" She hit the floor once more with the Hammer, and the Brawl world melted away. In its place was a race track and enough go-karts for all of them. "We can play Mario-Kart! Or, maybe..." She hit the floor again, and was inside of a spaceship, "we could be the crew on Firefly! Or we could..." BAM! She was surrounded by fields and tall grass. She tossed a Poké Ball into the air and caught it, "catch 'em all! So, who is going to try first?" The tech who had flicked the crystal piped up. "I volunteer as tribute!" "Oh, no no no. We aren't going to use ourselves as test subjects", the lead tech said. "We should try it with something small and NOT alive first." He looked around at the various fandom memorabilia in the room and stopped on the desk of the tech who wanted to reboot the system. "Like this thing." "No! Not my Limited Edition functional 1/16 scale replica of BB-8! I searched online for that forever!" With a quick roll of her eyes, she tossed the small toy through the gate. There was a quick flash of light and it landed in the tall, polygonal grass with a soft thud and light bounce. Omni-tan hopped over to it and picked it up. "Oh my goodness, it is so cute!" She played with it for a few seconds, "Let's see if I can give it back." She tossed it towards the gate, and with a second flash of light, it passed through and the tech caught it easily. She set it back on its stand. The tech grabbed it and held it tightly. The gate flickered a few more times in a pattern of hexagons, accompanied by a humming sound of something slowly powering off. While they could all still see Omni-tan and the surrounding world, it was not quite as bright as it was before. "Uh-oh," said Omni-tan and she wobbled slightly. "That felt really weird." "The Event Horizon has destabilized. With how the Omiversal Matrix works now, the power calculations are incredibly off. The E-Gate is going to need way more power and the capacitors in the gate that control the Event Horizon just can't handle it on such a short charge. When it kicks out, nothing will be able to pass though it again until the capacitors are charged up. I don't think we should try this again until we are sure we have enough power for it to work correctly." Just then, the barrier flashed hexagons in a faded out pattern and the area behind Omni-tan dimmed and the capacitors that powered the E-Gate blew out with sparks and a loud bang. The ruined parts began smoking. The gate at least still functioned but the barrier wasn't permeable anymore. "There it goes! Someone put that out!" The tech holding his prized toy replied. "More power? No problem. We have an infinite power source, right? Who needs the capacitors in the gate? Just plug it into the crystal!" "Um. It won't work that way." Omni-tan said sadly. "It can't draw power from the crystal. The Matrix has infinite power for itself and the worlds inside but that's it. The E-Gates have to be powered externally. It seems that it has to charge up on its own. The power requirements are massive but the longer you let it charge, the longer it will work as a portal. Right now, it's more like a window." "So, um, Omni-tan, how do you know all of this?" the lead tech queried. Omni-tan pointed at the giant mallet. "The Hammer told me, duh. Shouldn't you all know this already? I mean, you built it." "Well, what we know apparently is out the proverbial window, so to speak. Great, so even if we can get this working again, what if we wanted to use the gate for more than five or six seconds? Can someone go in there and stay in there till it charges up again?" Omni-tan paused. "Oh, I think that's a terribly bad idea. At least for people. The gate needs to stay charged. You have to wait for the appropriate amount of charge to build. Each time you use it, it automatically will drain back to zero. So, you'll need to fix it. Even still, let's say you wanted to use it for a weekend trip into the Matrix. You'd need to let it charge forâ€¦," another pause, "about a year. Besides, even if it works again, only I can activate the connection. If I don't want anything coming in, it isn't going to come in. This, this is my world now." She stammered the last words out. "So, we can't do anything more than talk to you for a year?" She looked around the room at her lab crew but no one had any ideas forthcoming at that moment. "Looks like it." She settled back onto the ground and very slowly started picking at the virtual grass. Each blade she pulled out dissipated into glowing pixels that flew off colorfully into the air. Omni-tan looked incredibly sad and her outfit had faded in color significantly. "All this. All of it. It's not enough is it?" The landscape around her faded slowly into just glowing lines in places. She stared downward at it and said softly, "What all of you tried to do. It all worked but it didn't work, did it? You don't even know if the gate will really work again. I don't even really know why I'm here or why I even exist. There's all of this, but I'm useless aren't I? That's what everyone is thinking. Everyone tried so hard and all you wound up with was me, and nowâ€¦" She trailed off. Her hand was shaking as it reached out and touched the barrier of the gate and a tear ran down her cheek. It hit the virtual floor and a glowing blue ripple ran through it extending out into infinity. No one knew what to say to her. All of this was unexpected and now they had no idea what to do with this wonderful creation that, at the moment, had no purpose beyond just sitting and being alone. Sure, she could create anything she wanted but she was sitting at a window to a world outside of her own. What do you tell a newly formed AI with unlimited potential that wasn't supposed to exist in the first place? She had been created by what was now a hammer that only she could use to build infinite world for people but now felt she had no purpose. It was a lot for them to take in; and, for her, It was only her first day in the world. The lead tech looked at her. "We'll keep you company. We didn't know any of this was going to happen and we aren't sure what to do yet but we'll figure something out to help you." She honestly didn't know what to say to her. Everyone's shock at what happened and then elation had now dissipated. All the work they had done over the years in this great creation had been starkly put in front of them as a, small, sad, AI girl who didn't know what to do. Everyone was silent for a while as Omni-tan sat in her vast, infinite, incredible virtual world and softly cried. There was a rolling sound and Omni-tan looked up to see the BB-8 toy at the gate. It beeped at her and bobbed its head. The tech who owned it waved at her. She couldn't help herself and laughed at it while tears still ran down her face. They melted away into golden light and she spoke. "You know, when I woke up I saw more of your world than just the room you're in. It's pretty rough out there at times. It made me sad but almost immediately I started wishing there was a way for people to escape reality of the world for just a little while. Then I realized that all of you are responsible for what is inside of me. In here." Omni-tan stood up and pointed at her where her heart would be. The world behind her started to light up slowly and then more brightly as she spoke. She held the World Forge upright and whole worlds shifted behind her and changed showing an incredible amount of creations. "All of that information you put in the crystal was because you saw the world should be a better place. You wanted to make somewhere people could have fun, and be creative, and show everyone something incredibly important â€“ hope! You wanted to build somewhere that anyone could achieve their dreams and help others along the way. Everything you did was selfless and for everyone else. Isn't that what everything is supposed to be about? That's what I am, aren't I? That's what I'm supposed to be! That's what I'm supposed to create! Hope for everyone!" There was a crescendo of sound, music and vibrations that shook the lab. The world behind her exploded into light and her eyes lit up and sparkled! Her world was on a glorious, glowing fire of creation that spread out forever. Everyone stared at her and somehow they knew that everything from then on would be incredibly fine. She suddenly gasped and everything went dark behind her and stone silent. After a moment, her eyes flashed and a smile slowly came across her face. I just had the best idea ever!" and with that, she slammed the hammer into the ground with a sound that shook reality. 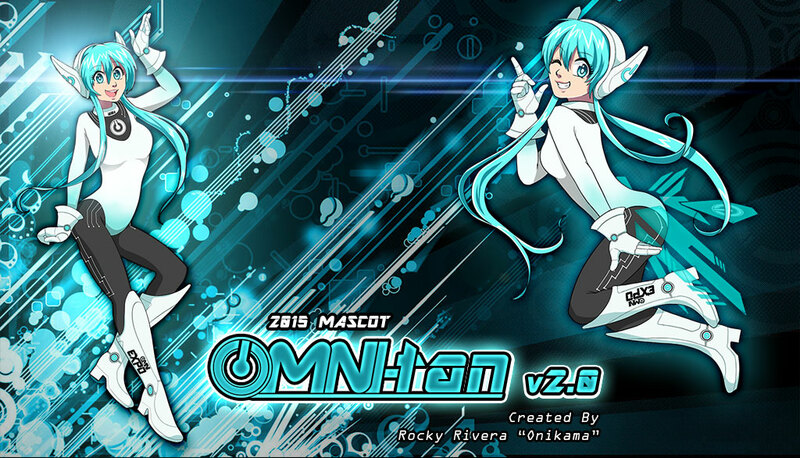 OMNI EXPO's 2015 mascot, Omni-tan, was created and designed by Rocky Rivera "Onikama". Onikama is an illustrator who claims to waste his paychecks on cosplay, doujin, figurines and endless merchandise. 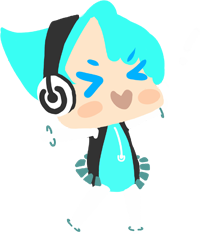 He also enjoys visual novels, MMOs, Kdramas and nearly everything in the anime community; his favorite fandoms being Dangan Ronpa, Tiger&Bunny, Magi and Nanatsu no Taizai. Bring him Reese's and he is yours forever. 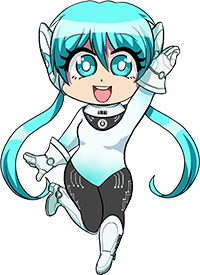 OMNI EXPO's original mascot, Omni-tan, was created and designed by Carolina Carreno. She enjoys drawing, reading, playing video games and using the internet...(mostly tumblr). She also likes cosplaying and going to conventions...and her favorite manga is One Piece.